I love Lush, sniffing around the store, watching kids run in and dump the ‘tester’ bath bombs into the water and run out again and seeing the stylish shop assistants trying to grin through bared teeth, dipping my fingers into any open tub and contemplating the small or big sizes of stuff because well, it’s not the cheapest of stores. However, before I bought this toner I honestly don’t think I had ever bought any Lush skincare. I had the lip scrubs, shower jelly, the tube of pink fun and some other bits and pieces but I don’t think skincare ever made its way on my list. The reason I chose lush as the place to buy my toner was that I knew they had a few options and I know they are quite good for people who have problematic skin. I wandered in one afternoon and it was empty, which is always v awkward. Not just in lush but when I go into any store that’s empty I feel instantly self-conscious. I usually go undetected in lush as they are always packed full of people sniffing zoella’s favourite bath bombs, but the day I went in I was alone and trying to try all of the free testers was nowhere near as fun. What does the tea tree toner do? From my understanding toners are just an added cleanser and you can spritz your face with the water after cleansing (before moisturising) and it just gives an added cleanse to your face by unclogging pores and just giving the skin a helping hand. 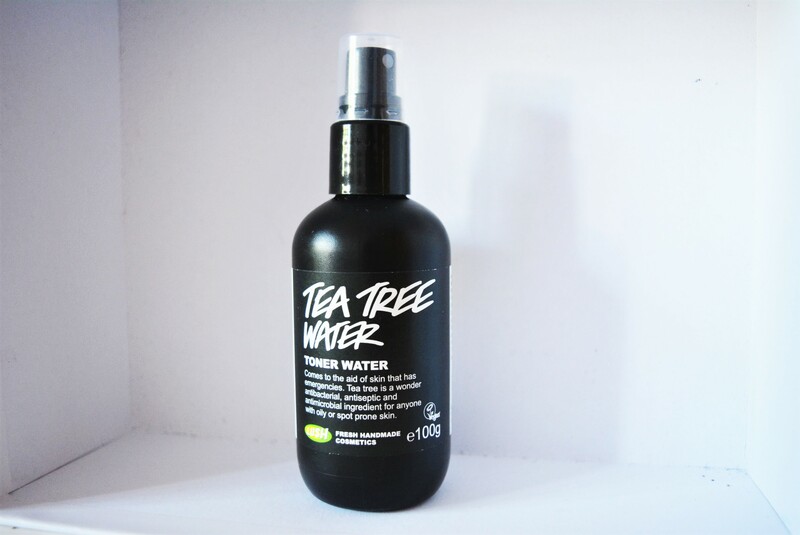 This tea tree toner water is meant for oily and/or spot prone skin, which in the summer months my skin is awful because of sun cream and clogged pores. The tea tree is antibacterial, antiseptic and antimicrobial so it really helps to just really remove all of the dirt and stop it from building up and causing spots. After Two Weeks What Do I Think? Some people think two weeks isn’t long enough and some people would say I could have done this review sooner but I like to wait around two weeks to see how my skin has reacted to a skincare product. Sometimes I can know instantly with skincare – my skin either glows or my skin gets spots, there’s no in between for me. I love spritzing it on after I have washed my face, it just makes you feel clean. The smell of tea tree is lovely and isn’t overpowering at all. I’ve noticed my skin is a lot less oily during the day. My skincare routine has been amazing since doing the trial, it’s encouraged me to take a lot more notice. My skin feels clearer and brighter. The spots I do get don’t last as long. I still get spots, they just don’t hang around for as long and aren’t as ‘angry’. My skin does feel a little dry on a morning. It’s pricier than a lot of other toners out there. If you have acne or really bad skin, I am not sure if it will do much. It feels great and does reduce inflammation on my spots and has made my skin a lot less oily but if you have terrible skin I don’t think it is going to help much at all. HOWEVER, if you get spots and just want something to stop them from being so angry at life, stop infections and inflammation, then I totally recommend it. I’ve noticed my spots don’t really ‘hurt’ and they have stopped spreading due to my skin being oily, so if you have oily skin and you are prone to a few spots then yes it’s amazing and I really would recommend it as it just stops the spread, stops the spot in its tracks and prevents future outbreaks. Thank you so much for reading, have you tried the lush tea tree toner? ← Previous Story A New Barely There Foundation – Am I Converted?